Educate-Me is a registered Egyptian non-profit foundation that was founded in June 2010 to redefine education in Egypt. They aspire to create an educational approach that would bring about people who pursue what they really want and would push boundaries in every field of knowledge, driven by their passion and curiosity. One that raises generations of learners, who can learn, unlearn and relearn, who have the courage and perseverance to change both themselves and the world around them; to create the world of their dreams. Educate Me's mission | To lead in education innovation in Egypt by developing and delivering self-directed learning programs that empower children to self-actualize and pursue their dreams. It all started when Yasmin Helal, then a 25-year old engineer at Alcatel-Lucent in Egypt, went out to grab lunch from work and ran into a man asking her for money on the street. After hearing his story and verifying that it was true, she decided to sponsor the man’s 3 girls to go back to school (what he asked for was the equivalent of a fast-food combo meal in Egypt). But then, after digging deeper to understand more about the Egyptian school system, she decided it was time to do more than reinstate children back to school. It was time to innovate in the Egyptian education space, to provide opportunities for children to direct their learning and move past rote memorization. Although 9 out of 10 children of primary school age in Egypt now attend school, the quality of education is low, with most schools focusing on rote memorization and teaching to the national test. As a result, Egypt has ranked last in primary education quality among all countries in the world, according to the World Economic Forum’s 2013-14 Global Competitiveness Report. Educate Me is working to change that. Educate Me has served over 1500 students, parents, and community members through its after school, parent literacy, and preschool programs using student-centered learning models. Over the past 5 years, Educate Me has grown from a mostly volunteer-based organization to a full-time foundation focused on education innovation in Egypt, with 40 staff members and over 50 active volunteers. In 2015, Educate Me decided to consolidate its focus on early childhood and primary education by phasing out its after school program and expanding its preschool program as well as developing a full-time primary education program, with accreditation by the Egyptian government to cover the national curriculum using Educate Me’s student-centered learning model. 1. Works with Educate Me to provide strategic advice on how to use data for decision-making to guide their scale-up process. 2. Is supporting an impact evaluation of its new early primary education program to understand how outcomes from this model compare to alternative models, to refine the organization’s theory of change, and to identify the correct metrics to incorporate into an ongoing monitoring and evaluation system. 3. Has attracted top advisors to support the impact evaluation, including global experts in early childhood education. 4. Has created global learning partnerships with pioneers in the field such as Aeiotu in Bogota, Columbia, to which RISE sponsored a global accelerator so they could connect directly with the founders of Aeiotu to gain insights on their model's evidence-based approach and growth strategy via public-private patnerships. "I’m blown away. The program has certainly exceeded my expectations. The learning environment is very open, and I love the group that has come together. I found all the content to be very useful and practical and I also love the mix of capacity-building workshops, leadership development, as well as sessions that allow us to reflect on ourselves as individuals. " "Being a part of the RISE fellowship program enables us to reach our full potential both on the personal level and on our organizational level. I feel grateful for having the chance to be exposed to this huge learning experience. " 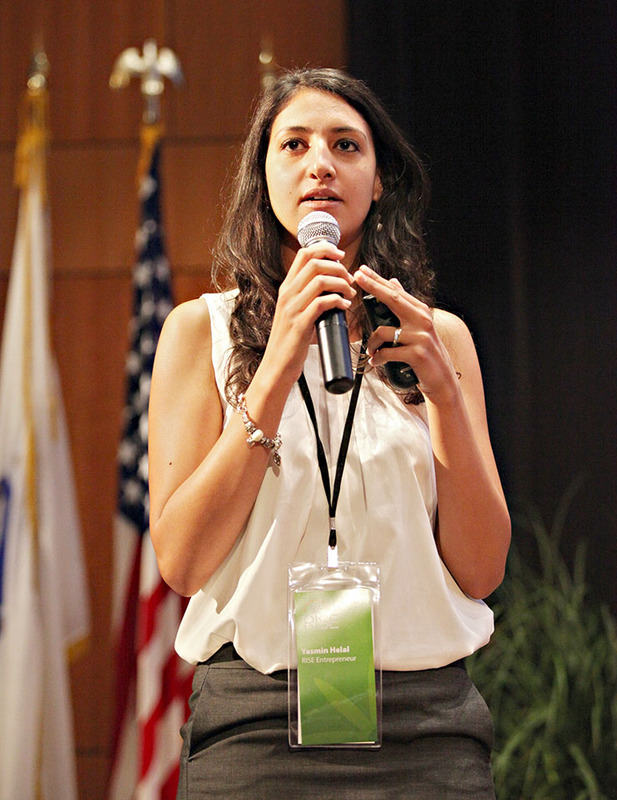 "I think what [Educate Me] is doing is an important contribution to Egypt’s overall development. " Keep up to date with all our upcoming events and latest news. RISE Egypt, Inc is a 501c3 Tax-exempt Non-profit Organization. Copyright RISE Egypt . All Rights Reserved.